Ash Kramer gets a special vibration from some amazing-value speakers, which punch well above their weight in every department, especially bass. ONE OF THE coolest aspects of technology is the trickle down effect. What was once an astonishingly innovative feature eventually becomes so mainstream that it’s barely remarkable. This is most common in the fastest moving areas of the industry – smartphones and computers for example – but occasionally, this phenomenon happens in hi-fi land too. A great example is the Balanced-Mode Radiator driver (BMR). I first encountered the rather odd looking, flat BMR driver back in 2009 when I got to hear Naim’s new Ovator 600 floorstanding speaker (reviewed here). The Ovator 600 was a $17,000 speaker at the time, so finding an exotic, new-tech driver nestled in the front baffle was no surprise at all. Cambridge Audio (CA) on the other hand, is a company that isn’t really into speakers costing close to 20 grand, but it is into value. So maybe it’s not a huge surprise to see BMR technology rolling down into speakers much less expensive. CA’s Minx range of tiny home theatre speakers has housed BMR drivers for years, but the Aero range of hi-fi and home theatre speakers is the first to feature BMR’s in a dedicated hi-fi application. The Aero 2 is a two-way, front-ported, stand-mount design. A fairly big cabinet (203 x 370 x 311mm WxHxD) houses a 46mm (2-inch) BMR and a 165mm (6.5-inch) woofer. Strangely enough, the bass driver is described by CA as a “high power subwoofer”. Of course, this description is at least a little iffy, but in fact, the company’s marketing people aren’t really being disingenuous here. We can disregard the “high power” bit of the blurb because after all, the bass driver isn’t powered, but the subwoofer part is more or less heading in the right direction. 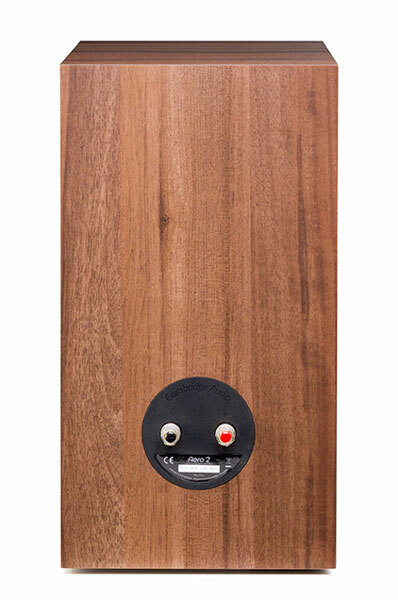 Unlike most mid/bass drivers in similarly sized speakers, this really is a bass driver – it only covers a small part of the frequency range – reaching down from 250Hz. Amazingly enough, the little BMR driver covers everything from 250Hz right up to 22kHz, which is a feat tweeters can’t even begin to approach. This apparent audio magic happens because BMR drivers combine the movement of pistonic drivers at lower frequencies and flat panel speakers at higher frequencies. This allows it to cover a dramatically wider frequency range than a conventional driver, but it also means that the sound disperses in a wider field, which has benefits for room placement. The huge frequency range of the BMR means that the bass driver is designed specifically to cover nothing but the bass frequencies, which should translate into better low frequency performance. From a specifications perspective, the Aero 2 certainly seems to be able to reach down low, hitting 40Hz, which is impressive in a speaker this size. The most important benefit of the BMR is perhaps that it moves the crossover point between tweeter and woofer away from the more usual 3kHz way down to 250Hz. The human ear is far more sensitive in that 3kHz range, which means we’re perfectly programmed to hear even slight issues and imperfections right where a standard tweeter crosses over to a midrange driver. At 250Hz however, the ear is more or less happy to just chill out and enjoy the sounds it’s hearing. It’s worth noting that this is a newer generation of BMR driver, the third to be precise, so it’s benefited from the substantial development needed for it to be optimised for use in hi-fi speakers. Overall, the look of the Aero 2’s is restrained. They’re wrapped in vinyl, which is fine at the price. 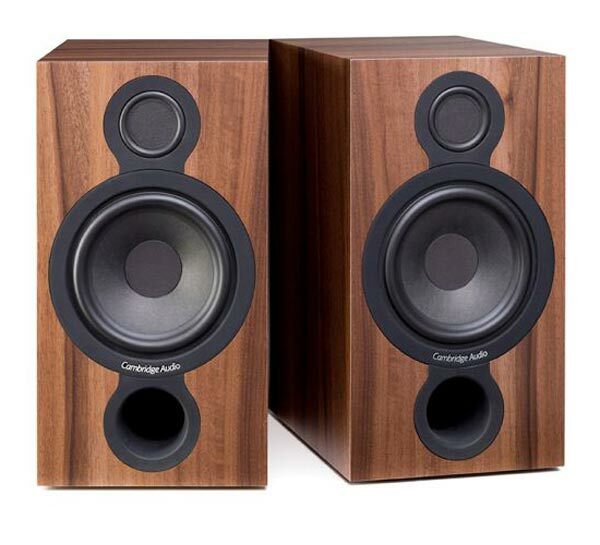 With grilles on, they look much like any other comparably priced speaker but with the grilles removed, the BMR driver makes them look pretty plain – the flat design of the driver just doesn’t have the visual impact of a tweeter, although that might be down to sheer visual unfamiliarity on my part. A nice touch is that the driver’s are mounted using hidden screws – there are no screw heads or allen bolt tops poking their heads above the front baffle. At 6.8kg per speaker, they’re reasonably well built without being super-solid – again, this isn’t an issue at the price. There’s a single set of speaker terminals at the back. When the Aero 2 was first released, I had a chat about the new range with Paul Quilter of PQ Imports, the local CA agents. His feedback was that it had taken him a while to get used to the sound of the speakers, particularly at the top end, where they seemed a little laid back compared to a tweeter-based speaker. When I fired up the review pair, I had exactly the same experience (and no, I wasn’t being unduly influenced by Paul’s comment). Hooked up to CA’s own Minx Xi Digital Music System (reviewed here) and playing music I knew well, I thought that the Aero 2’s were more than a little laid back and almost soft at the top. But I was definitely impressed with the bass performance which was big, to put it mildly – more on this later. However, it didn’t take me long to change my mind about that top end. To start with, I just followed my usual protocol and left the Aero 2’s to get a good few days of playback on them before I settled into some critical listening with higher resolution sources. This little system sounded so good to me that I didn’t bother making any changes. The more I listened, the more I grew to appreciate that top end, and when I got round to hooking up my Marantz SA8260 SACD player to the Xi, the Aero 2’s just kept impressing – they’re not soft at all, nor are they rolled off, they’re just different. That BMR is hugely capable, all the more so when the price of the speakers is brought into the equation. The treble it produces is deeply subtle and filled with textures and nuance, yet to my ears, it carries as much detail as a conventional dome tweeter. Loads of adjectives come to mind, the kind usually reserved for speakers that cost a lot more money than this, but rather than dive into that morass, let’s just say that this is among the best treble I’ve heard at this price point. The way the BMR handles the midrange is also special because there’s absolutely no disconnect whatsoever from the top to where the woofer takes over. The transition from BMR to woofer is pretty darn smooth too, and this cohesiveness is a big part of the reason that these speakers sound so good. Over the years, I’ve spent a frankly astonishing amount of time listening to what has to be Calexico’s best album, the superb Carried To Dust CD from 2008. It’s become something of a go to disc when I want to mellow out, but it’s also nicely recorded with an impressive mix of instruments and styles, so it makes for a good review disc. It sounded quite lovely on the Aero 2/Xi combo, which together offer a smooth overall character that’s beautifully matched by the ability to highlight the details in the recording without shouting about it. Instrumental separation is excellent, as is sound staging (both width and height) and imaging. Dynamics and speed are also right up there, driven by the quality of the bass. That woofer really does an amazing job, reaching down far lower than expected. There were times when I had to take a step back mentally and remember what I was listening to here – a set of inexpensive standmounts matched up to an all-in-one music system. The Aero 2’s go deeper than a number of small floorstanders I’ve heard but the bass isn’t created the way it’s often done in small speakers – where the port is doing much of the work. Here, the port’s contribution is quite understated, and it never adds in more than it should, which is an impressive piece of engineering. So what you end up with is fast, tight and expressive bass that suits all kinds of music – there’s nothing mini-monitor-like about the way the Aero 2’s get down and boogie. Pump up the volume with something raucous like ‘Glory And Consequences’ from Ben Harper & The Innocent Criminals’ Live From Mars and the 90dB sensitive Aero 2’s punch hard, well above their weight in terms of bass impact and quality. Bass guitar notes absolutely rock into the room, and drums hit hard. Even with the Xi turned way up, there’s no particular sense of compression – the woofer just keeps on going, while the BMR seems basically unbreakable. You really need to get carried away before common sense pokes its head round the door and suggests that more moderate levels are indicated. That big sound and the wide soundstage (again courtesy of the BMR) allow the Aero 2’s to easily fill a large room. They’re also quite unfussed by room placement, seeming to be more than happy just a foot or so from a rear wall. So while there are bigger models in the range, these speakers are in a particularly nice sweet spot for many New Zealand homes and budgets. It’s possible to build a ceiling-high fort using sub-$1000 stand mount speakers because there are just so many options out there. Some are excellent, others not so much but I can’t recall any conventional dome tweeter – either soft or metal – sounding quiet this good. Some listeners will want even more resolution through the treble range – the kind that you do get from a dome tweeter. But in the months I had the Aero 2’s, I never felt as if I was missing anything at the top – quite the opposite. On first listen, these speakers might sound a touch restrained, but that’s only compared to what you’re used to. Give that BMR’s treble a chance and you’ll likely find it to be as addictive as I did. I also can’t quite remember a set of speakers that could get this low while still offering such primo bass quality for anything approaching this kind of money. Stand out standmount speakers such as Wharfedale’s old Diamond 9.1’s would be appropriate competition for the Aero 2’s, if only because I have such fond memories of owning a piano gloss set, which were gorgeous, but they never managed to sound this big or to punch this hard as far as I recall. That’s likely to be the case for much of the competition at the price. Negatives? Not a thing. They’re easy to drive, and deliver a lot of detail while being deliciously smooth, which means that they’re perfectly suited to budget amplifiers or music systems like the Minx Xi. I ran them off the Xi, NAD’s D3020 integrated (reviewed here) as well as Naim’s DAC-V1 and NAP100 DAC and power amp combination (reviewed here), and in every case, they sounded great and not just at the price. Like some of the best review gear I’ve had the pleasure of reviewing over the years, the Aero 2’s stayed in place longer than they needed to, and they were missed when they went back.